If we want to understand how substellar objects (that is, with masses below 0.08 solar masses) are born, evolve, and exchange material and momentum with their surroundings, then spin measurements can provide an excellent probe. The physics is likely to be very different from that of stars, so can’t just observe stars as analogs. But measuring the spins of substellar objects is hard. It is difficult to obtain enough photons to make a high-signal-to-noise measurement. Plus, if the object is orbiting a host star, one faces the perennial high-contrast problem of trying to make out a dim object in the blinding glare of another object which is several orders of magnitude brighter. Nevertheless, a few dozen young brown dwarfs (13-80 Jupiter masses) have had their spins measured, with results suggesting that brown dwarfs do not experience the extended spin-down periods that stars do. The authors’ tool of choice was the NIRSPEC spectrograph at the Keck II telescope. NIRSPEC allowed them to take spectra of sufficiently high resolution of water and CO absorption bandheads around 2.3 microns, and Keck’s 10-m diameter mirror allowed them to scoop up just about as many photons as they could from the ground. They measured the object spins from the absorption lines’ rotational broadening, which is just what it sounds like– absorption lines broaden if they are produced by a spinning object, because absorbing material is moving to and fro along the observer’s line-of-sight and this introduces a small positive and negative relativistic Doppler shift. Then, they cross-correlated the spectra with model broadened spectra, and found the best match corresponding to the object’s spin velocity, v, multiplied by the effect from an unknown tilt of the object relative to us, sin(i). They quantified the rotation speed as fractions of the planets’ break-up speeds, or the speed at which an object rotates so fast that it flings material away. 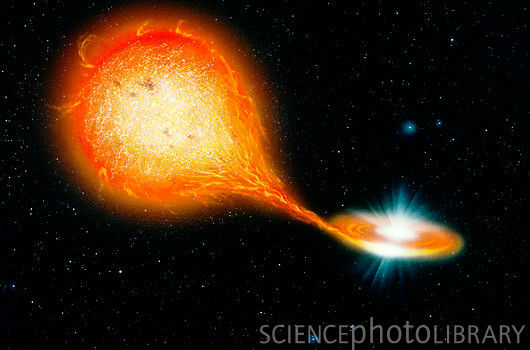 The break-up speeds are probably close to the speed at which planets first start spinning at birth, because clouds of collapsing gas contain lots and lots of angular momentum. Figure 1: Rotation speeds as fractions of the primordial break-up speeds, for planets (left) and brown dwarfs (right). Figure 2 in today’s paper. There is some uncertainty in this fractional speed, of course. The objects’ tilts relative to us could not be measured (and will not be measurable for some time to come), and the break-up speed itself is poorly constrained. But after taking these uncertainties into account, the authors find most likely fractional break-up speeds of both the planets and the brown dwarfs to be hovering around ~0.1 or 0.2 (Figure 1). They found that the spins do not change very much over the range of ages of these objects, and, after a couple statistical tests, they conclude that the spin distributions of both the planets and the brown dwarfs appear to be from the same distribution. This is a very initial look at exoplanet spins—the sample size is tiny, after all—but it suggests two broad alternatives: 1., the physics that set planets and brown dwarfs spinning are similar; or 2., the rates of spin are a poor function of two different sets of formation physics. The authors provide some back-of-the-envelope calculations which pull together the effects of gravitational contraction and accretion (both of which will cause the object to spin up), and some source of spin-down, “whatever it may be”, at the efficiency necessary to reproduce the low rotation speeds. Figure 2 shows how we might expect massive planet spins to evolve. With future constraints from 30-m-class telescopes, we may elucidate what, exactly, the source of the spin-down is. And if evidence accumulates that the physics of brown dwarf disks and circumplanetary disks are indeed similar, we might even be able to use the former as a proxy to study the latter– which will give us another leg up on the study of planet formation! 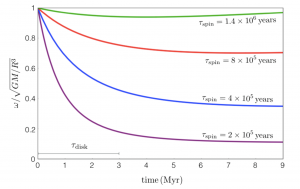 Figure 2: The possible spin evolution of massive planets after gas accretion, based on some back-of-the-envelope calculations. Lines start at the break-up speed on the y-axis. Tau-disk is an assumed disk dissipation timescale, and tau-spin is a characteristic spin-down timescale. The bottom curve matches the observed rotation speeds most closely. Supplementary Figure 7 from today’s paper.